This traditional Goan recipe of vindaloo is for all the vegetarians who have wanted to try the vindaloo curry but never knew as to what would be a good substitute for meat. I got inspired to do this recipe after watching the Living Well Network. Since tomato was used as the base for the recipe I decided to add a bit of spice but making it with Vindaloo Masala . This recipe works more as a entrée’ then as a side. If you are a converted vegetarian or vegan than you can add the typical side of a good steak like I did, mashed potatoes and spiced caramelized onions. This is surely to be vegetarian heaven if I may say so. 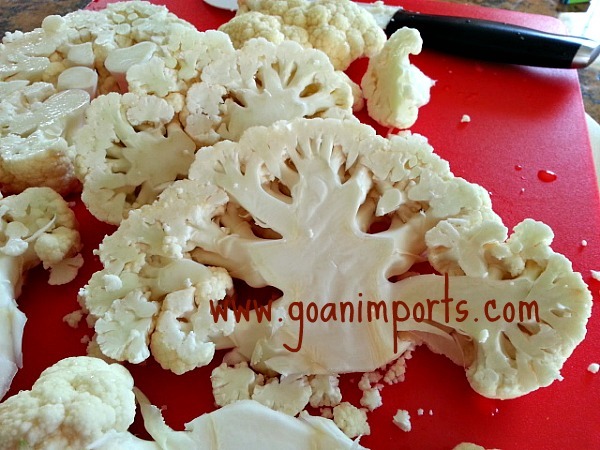 Do note that you will need a large shallow pan so to easily lay the cauliflower steaks. It’s the most easiest of all recipe perfect for the busy weeknight or lazy weekends. 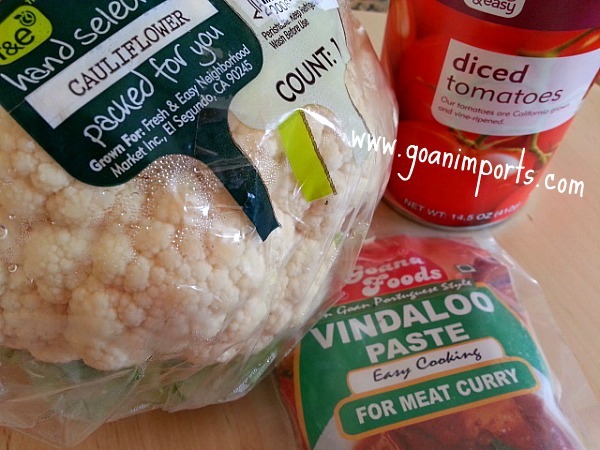 Ingredients for Cauliflower Vindaloo Steak. Cauliflower steaks about 3/4 inch thick. Warm up the oil add the vindaloo paste and saute for 15-20 second then add the canned tomato. Saute for 2-3 minutes. Add the sugar, water and salt to taste. Next lay the cauliflower in pan without over crowding it. Cover and cook for 20-25 minutes covered on medium heat till cauliflower is soften. Take off the lid so that the sauce thicken. 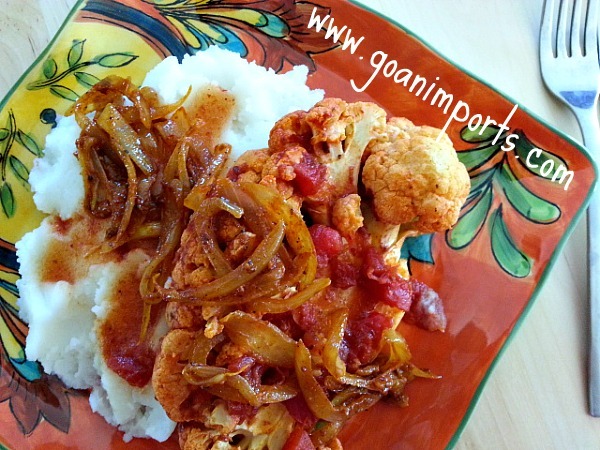 Serve the cauliflower vindaloo steak on a bed of mashed potatoes and spiced caramelized onions. Sounds yummy- will def try it. Where do u get the vindaloo paste from? I mean what aisle in the Indian market. Thanks Neha :-), the one I use is imported from Goa and you can find it at http://www.goanimports.com. Looks delicious! I may be drooling. And I’ll check out your imports. Hi Thanks for following mine.Urs look attractive.One of my konkani friend from Goa taught me a vegetable recipe ingredients and dal and potato The paste consists of tamarind,coconut,onion,garlic and one more.i forgot the method but cannot forget the taste.If u know that do share here.Thanks. Yes it is Thank you. I fell in love with all things gobi while in India. And I am almost total veg now after my Indian trip. Sometimes I eat a bit of meat, but I made lots of cow friends walking the streets! You are funny Anne :-). Yes the cow’s in India you can’t miss them. They are everywhere. My husband and I have cut down a lot on meat as well. I think it is healthier and certainly for the animals ! Thanks M, I do agree, its hard to find too many vegetarian recipes in Goan cuisine. A lot of my vegetarian friends have made that statement as well. So I have been working on adding more vegetarian recipes to my site. Thanks for stopping by.